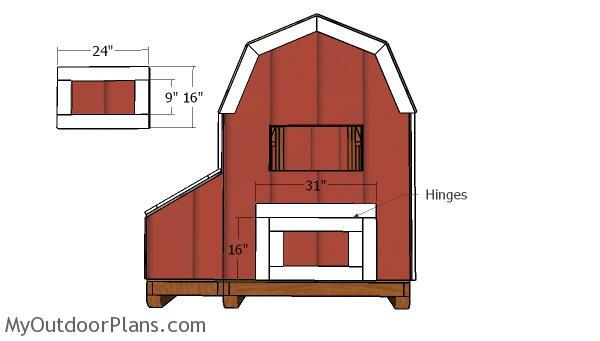 This step by step diy project is about 7 ft tall barn chicken coop roof plans. 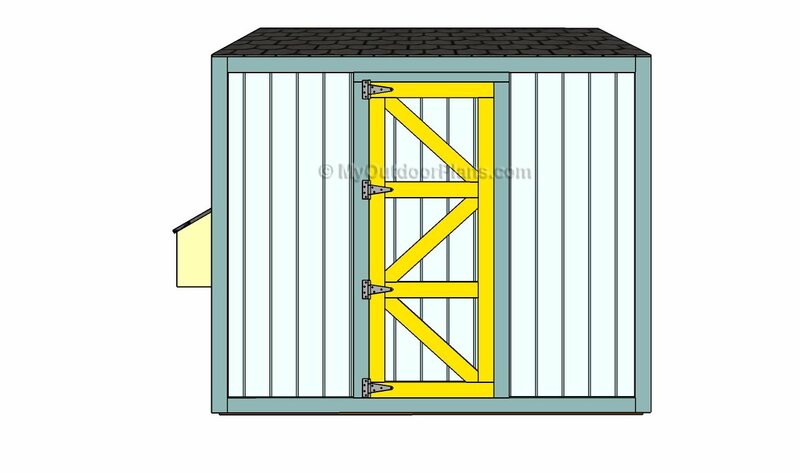 This is PART 4 of the chicken coop project, where I show you how to build the front door and the back. 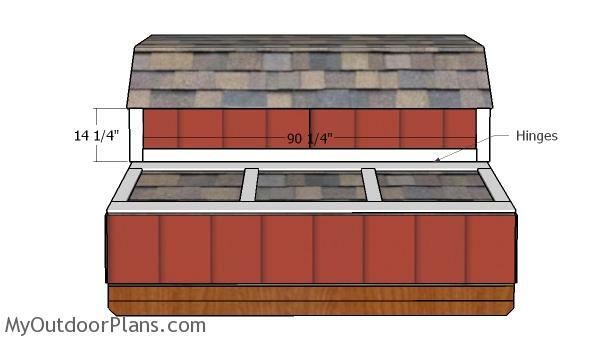 In addition, I show you how to attach the decorative trims, so you can make the coop pretty. Make sure you secure everything with attention and make adjustments to my plans, if necessary. Take a look over the rest of my woodworking plans, if you want to get more building inspiration. First of all, you need to build the back door for the chicken coop. Use T1-11 siding and 1×4 lumber for the frame. 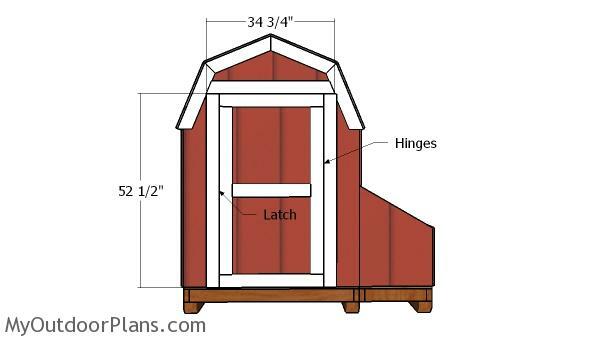 Attach the trims to the siding panel and use glue and 1 1/4″ screws to assemble the door tightly. Fit 1×4 lumber around the opening and insert 2″ nails. Use hinges and a latch to secure the door into place tightly. 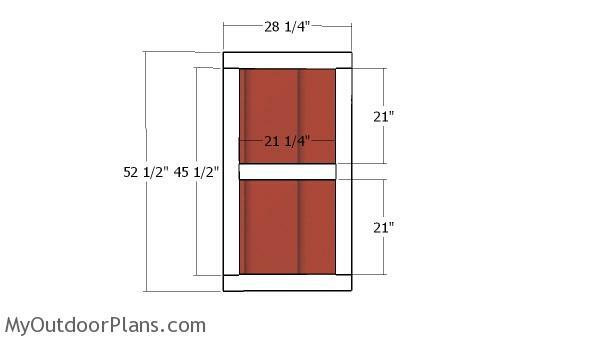 Use T1-11 siding for the door panels and 1×4 lumber for the door frame. Lay the panels on a level surface and then attach the trims. Leave no gaps between the components, drill pilot holes and insert 1 1/4″ screws. Make sure the edges are flush, otherwise the doors won’t fit into place properly. Check if the corners are square. Fit the 1×4 trims around the opening. Align the edges with attention and insert 2″ nails, every 8″ along the framing. Install hinges to lock the door into place tightly and then make sure it opens and closes easily. Install a latch to lock the door into place. Use the piece that you cut out in the previous steps for the door panel. Fit the trims to the side of the chicken coop. Fit the trims to the opposite side of the coop. 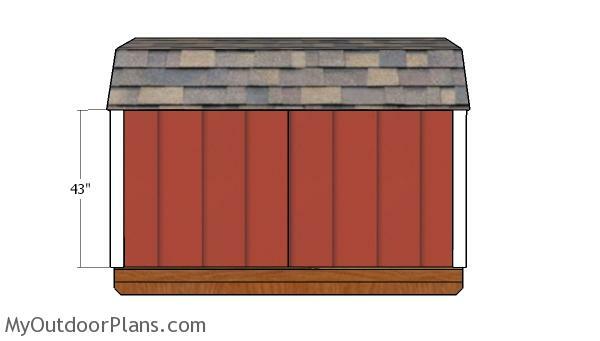 Fit 1×4 trims to the front of the chicken coop. Align the edges with attention and insert 2″ nails, every 8″ along the framing. Fit the 1×4 trims to the back of the chicken coop. Align the edges with attention and use 2″ nails to lock it into place tightly. Fit 1×4 trims around the window. 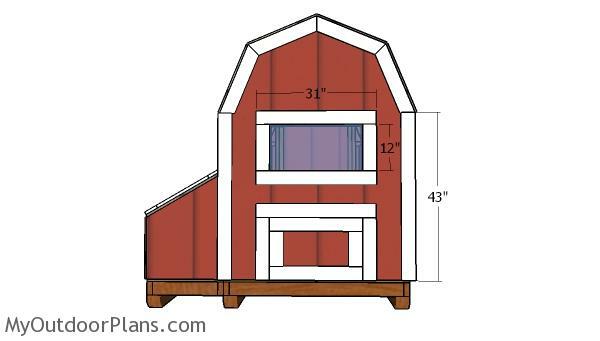 This 4×8 gambrel shed chicken coop is easy to build and extremely durable. 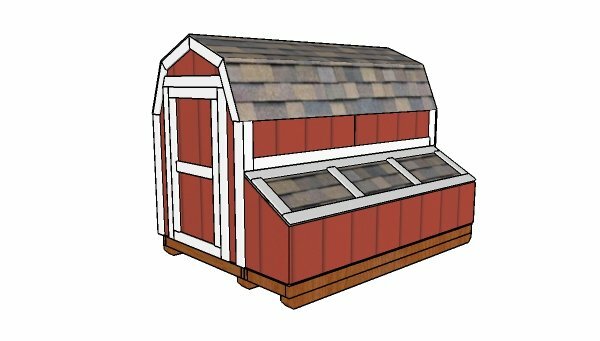 This chicken coop is ideal for raising several chickens to get fresh eggs. Moreover, this coop has a nice design and it is super easy to build. 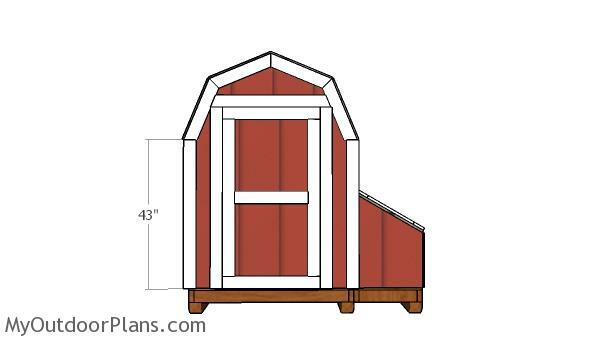 Remember that I have tons of other chicken coop plans on MyOutdoorPlans, so take a look HERE. 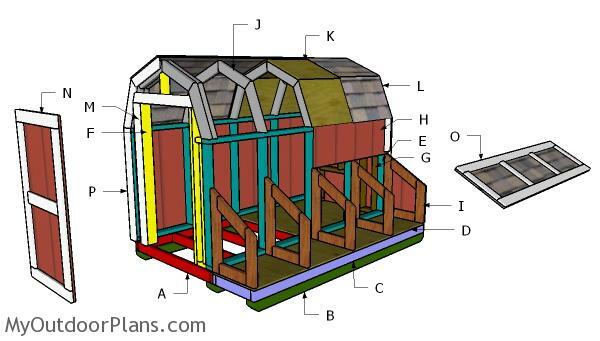 Check out PART 1, PART 2 and PART 3 of the project, so you learn how to build the frame of the coop, the roof and the nesting boxes. This woodworking project was about 7 ft tall chicken coop door plans free. If you want to see more outdoor plans, check out the rest of our step by step projects and follow the instructions to obtain a professional result.